Autograph album with inscriptions to Nellie and Nell, dated from 1885 to 1902. 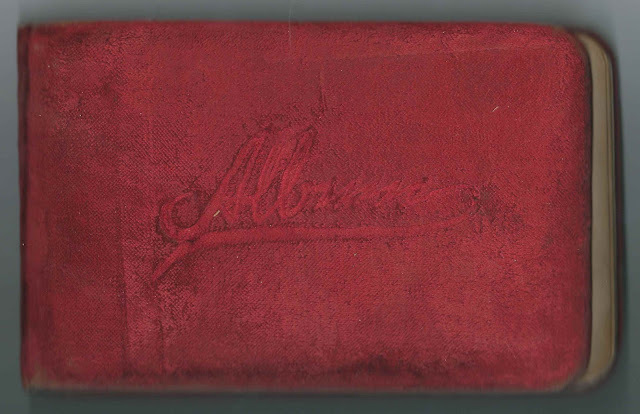 I believe the owner was Ellen (Ryan) McCann of Fall Brook, Pennsylvania, and Syracuse, New York, from before and after her 1888 marriage to John F. McCann. 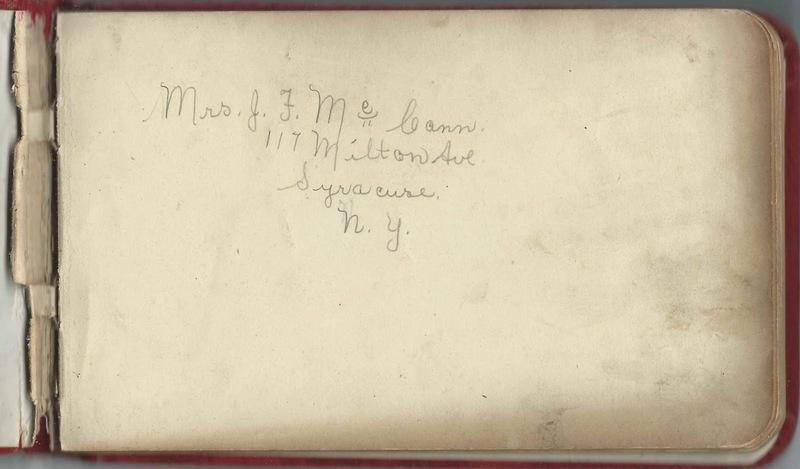 Nellie inscribed the ownership page, when she was living at 117 Milton Avenue, Syracuse, New York. The album measures approximately 7-3/4" by 5" and contains the sentiments of 21 of Nellie's relatives and friends. An alphabetical surname list and an alphabetical list of the inscribers, together with any personal information they offered, appear at the end of this post. Marriage record of John F. McCann, age 21, and Ellen Ryan, age 17, both never married and both of Fall Brook, Pennsylvania; marriage at Wellsboro, Pennsylvania, on May 2, 1888 at St. Andrews Church Blossburg. John's father is shown as John McCann; Ellen's father is shown as Thomas Ryan. Cousin - Mary E. Dwyer; inscribed at Fall Brook, Pennsylvania, on January 19, 1896. 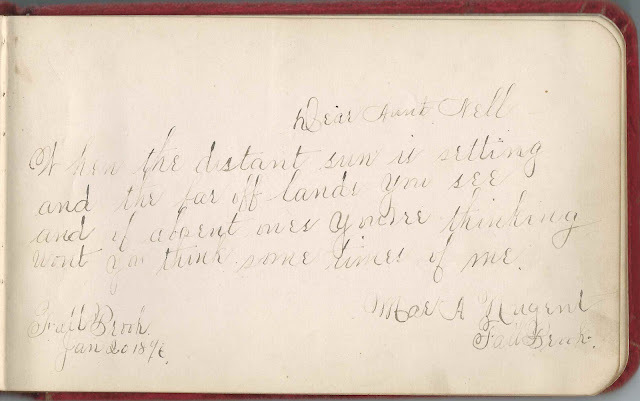 Perhaps the same Mary Dwyer who inscribed another page in 1885. 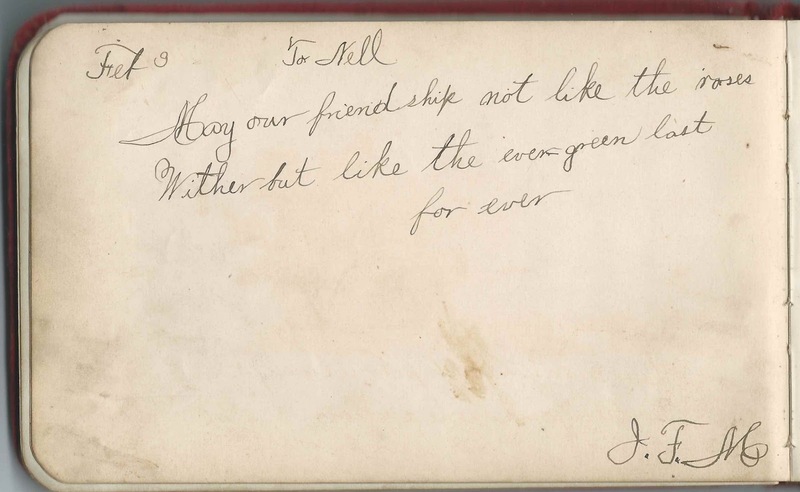 Nephew - James Nugent; inscribed on January 22, 1896. Niece - Mae A. Nugent of Fall Brook, Pennsylvania; inscribed at Fall Brook, Pennsylvania, on January 20, 1896. 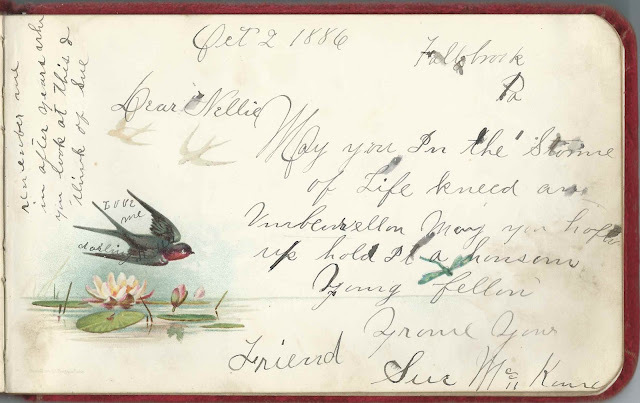 I'm not sure of the inscriber's first name; if you feel the name is something different, please leave a comment. If you can tie these clues together in order to verify that Mrs. J. F. McCann was Ellen (Ryan) McCann, "Nellie", or another person, please leave a comment or contact me directly. The J. F. M. who inscribed a page "To Nell" on February 3 [no year written] might have been John F. McCann. Assuming Mrs. J. F. McCann was Ellen (Ryan) McCann, "Nellie": She was the daughter of Thomas Ryan of Fall Brook, Pennsylvania; her mother may have been Catherine (Nolan) Ryan. It's interesting to note that Fall Brook, Pennsylvania, in Tioga County, was developed in the 1860s for coal production. Perhaps the 1885 inscriptions from Fall Brook are an indication that the Ryan Family and/or the McCann family may have been drawn there because of job opportunities. Eventually coal production ended at Fall Brook, and the town ceased to exist. I believe John F. McCann died in 1932, but I haven't found a record of that. If you have further information on the McCann and Ryan families or a theory as to a different identity for Mrs. J. F. McCann of Syracuse, New York, please leave a comment or contact me directly. If you can deduce the inscriber's name in the image below, please leave a comment. H. G. P.; not sure of last initial - could be I or J or ? J. F. M., inscribed "To Nell", on Feb 3, no year written. Could this be Nellie's husband John F. McCann? Mary Dwyer; inscribed at Fall Brook, Pennsylvania, on December 29, 1885; Nellie's cousin. Perhaps the Mary E. Dwyer who inscribed another page in 1896. Mary E. Dwyer; inscribed at Fall Brook, Pennsylvania, on January 19, 1896. Nellie's cousin; perhaps the same Mary Dwyer who inscribed another page in 1885. Mame Lyons of Kingston, Ontario; inscribed at Syracuse, New York on December 19, 1902. Not sure of given name.